I'm often asked how you choose the right tiny house heater. 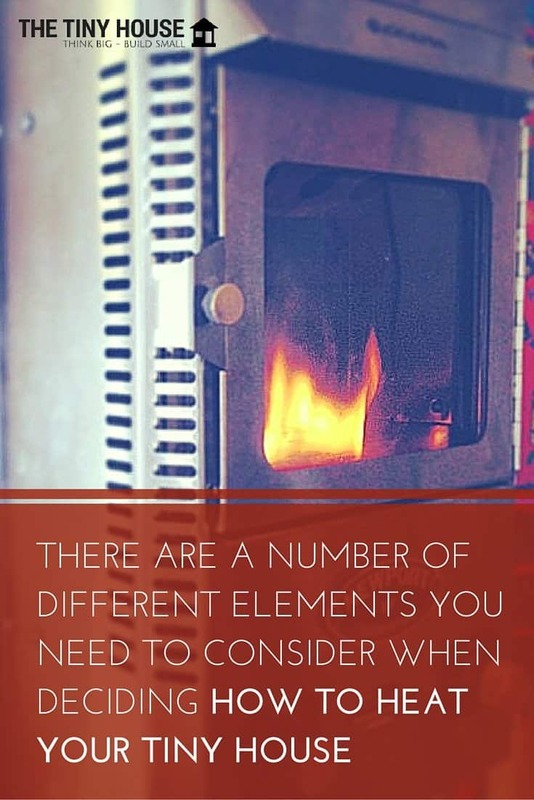 It's a good question because there are a number of different elements you need to consider when deciding how to heat your tiny house. In this video and post, I'll take you step-by-step through the process of finding the right heater for you and your tiny house, using my own search for a new heater to guide us through the process. The first thing to consider when you're choosing a heater for your tiny house is how powerful it needs to be. Luckily, you don’t have to guess, because you can use free online calculators called Btu calculators. Btu is a unit of heat that's commonly used in the heating and cooling industry. It stands for British thermal time and most heaters are rated in BTUs. Finding the right heater for your tiny house is partly a case of finding a heater that'll provide you with the right amount of Btus. Let's say I'm looking for a new heater and I've searched Google for a Btu calculator. I've found two and I'm going to use them both because I want to show you that this isn’t an exact science. You might want to use a couple of different calculators and see which numbers they give you before you choose a heater for your house. My result tells me that, on the coldest of days (if it were -20 degrees, for example), I would need 23,000 Btus per hour of heat in order to heat my tiny house. That’s a much higher number than I’m planning on getting for my house because most of the time I’m not going to need a 75 degree temperature increase. I’m probably only going to need a 50 degree temperature increase. You'll want to play around with these numbers. For example, I'll try 50 degrees for my tiny house. Telling the calculator I need a 50 degree temperature increase tells me I'll need 15000 Btus, which is more than the range of what I'm planning on using. Once you've found a Btu recommendation from one calculator, I'd recommend using another. I've chosen to use the calculator below because it takes some additional dynamics into consideration. This calculator is saying that 9,300 Btu per hour are required to heat my room, which is obviously a much lower number than the other calculator. You really have to take an average when you're doing this. I would say that, for my house, I need somewhere between 9,000 on the low end and 20,000 on the high end. Keep in mind that this is a number for the absolute coldest day, so I’d say that a heater with between 12,000 and 18,000 Btu would probably be good for my tiny house. I could always supplement that with electric heat, by using a small space heater on a really cold -30 degree day, when my main heater just isn’t doing it. Now that we’ve figured out how may Btus we need, it's time to start researching heaters online. Continuing with my tiny house example, I've abandoned my Dickinson Newport Propane Heater. It’s never been able to heat my tiny house properly and it’s never been able to vent properly. It’s a long story, which I'll tell in another blog post, but I am currently on the market for a new heater, so I’m actually going to buy one of the heaters we're going to look at now. But before we talk about what to look for in a heater, I want to show you what you should avoid at all costs. You should not get a vent-free heater. I know these heaters are tempting because they’re very powerful. The one below offers 10,000 Btus for $187, for example. The problem with vent-free heaters is that tiny houses are new constructions, so they tend to be well insulated and very tight structures, which means that not a lot of fresh air can get in and out of them. Burning a propane appliance like this in your tiny house will not only create a lot of condensation but it'll also deplete your the oxygen levels in your house and create carbon monoxide, which is not what you want. I'd therefore seriously suggest avoiding vent-free heaters. I know this means literally adding another zero to the price to get a direct vent propane heater, but unfortunately vent-free heaters are just not safe for tiny houses. They’re meant for garages, sheds, and other structures that are not as airtight as tiny houses, so don't get one. Let's say you come across a direct vent heater that looks promising. To illustrate this point, I’ll pull up a heater that I’m a big fan of – the Mini Franklin from Woodstock Soapstone. What’s cool about this stove is that it runs on propane but that it looks like a wood stove. It’s got that nice thermal mass of the soapstone and the cast iron, so this thing really heats up and keeps you warm. Before we do anything else, we of course want to check the Btus. I would suggest that if you figure that you need 12,000 Btus, you should get a stove that can do more than 12,000 Btus, so that it’s not running all the time. I can see that this heater does 8,000 Btus. Moving on, we need to look for clearances. Clearances are how much space is required below the stove, behind the stove, next to the stove, and on top of the stove. Clearances differ a lot depending on which unit you buy. Knowing a heater's clearances will help you to work out where in your tiny house it can go and how much space it’s going to take up. First of all, we'll just scan the page and see if it displays the clearances. The side clearance here is two inches, which is quite low. This means I could have this heater two inches away from an intersecting wall, so that's great. The corner clearance is 1.5 inches. Above it you need 12 inches of space, behind it you need 2 inches, and in front (where most of the heat will be coming out), you need 20 inches. While the clearances look good and I really like this heater, I’m not sure it would be powerful enough for my house, so let's look at another heater. Let's look at the Williams High Efficiency Direct-Vent Furnace. I’ve been looking at these heaters for a while and I think this is the model I’m going to go with. What’s great about this heater is that it offers 17,000 Btus, which is right in that sweet spot for me. The other thing that’s great about it is the clearances: 2 inches to an intersecting wall, 10 inches from the top of the furnace to the ceiling or overhang, one quarter inch to the back wall, and 2 inches to the floor. That’s really nice and compact, which is fantastic. Now that I've found a heater that fits my Btu and the clearances requirements, it's time to find out whether or not it's thermostatically controlled. Could I set a thermostat, leave my house for the day, and keep the house warm? With this heater, I could. The Dickinson heater does not do that; it’s on or off, and all manual. I do believe that the Mini Franklin can be hooked up to a thermostat. Now that I’ve found a heater that I think has the right Btu output and the right clearances, and that can be run on a thermostat, I'll look at the manual for the unit. The manual is usually linked to on the product page, so I'll click that link. This is where things can get a little bit gnarly. Once, I've got the manual open, I’ll take a look at what kind of venting requirements there are. I want to get an idea of what I’m going to have to put on the outside of my tiny house. Is the heater going to have to go through the roof? Can it go through a wall? To find out, I'll run a search for the word “vent” and have a read. Another thing you might want to look for it whether or not the unit is cleared to be used in a mobile home, because that will give you an idea of whether or not the heater was designed to be used in a moving house. If nothing jumps out at you as you read through the manual, the heater could be a goer. Something that drove me away from the Mini Franklin was the strange vent stack that it requires you to have on the outside of your house. It seems to be about 3 or 4 feet long. I don’t want to have extra stuff on the outside of my house, so I decided against this heater. The Williams unit, however, just uses a very simple thimble cap on the outside, as pictured below. I like how much more minimalist and less noticeable this heater is. If you're happy what what you find, you've probably found yourself a winning heater! Calculate how many Btus you’ll need your heater to provide. Stay away from vent-free propane heaters. Check that the clearances will work for your tiny house. Find out whether or not the heater can be run on a thermostat. Find out what kind of venting the heater requires. Check out what the heater looks like when it's been installed. Work out whether the heater will have to go through the wall or ceiling of your tiny house. If you go through all of those steps and find a heater that meets all of your needs, you should have no problems heating your tiny house. I hope this has been helpful. Feel free to leave a comment below if you have any additional questions about tiny house heaters. If so, make sure you check out Tiny House Decisions. This guide contains all of my best thinking on tiny houses to help you go from just wanting a tiny house to actually having a tiny house. In it, I go through all of the systems that you'll need to consider, like heating, plumbing, and electric. I talk about tiny house design, including how big your tiny house should be and whether or not it should it be on wheels. I even talk about specific construction techniques that I used to make my tiny house a success. Tiny House Decisions is the resource that you need to bring your tiny house dreams into reality, so check it out here.